ill, and a man takes a taxi hostage in the middle of rush hour traffic. to beat the traffic back to their apartment in time for the showing. a great journey. And no, the dog doesn't die. The basis for the major motion picture 5 Flights Up starring Diane Keaton and Morgan Freeman. New York City is on high alert—a gasoline truck is “stuck” in the Midtown tunnel and the driver has fled. Through panic and gridlock, Alex and Ruth must transport their beloved old dachshund—whose back legs are suddenly paralyzed—to the animal hospital, using a cutting board as a stretcher. But this is also the weekend when Alex and Ruth must sell the apartment in which they have lived for most of their adult lives. Over the course of forty-eight hours, as the mystery of the missing truck driver terrorizes the city and the dachshund’s life hangs in the balance, the bidding war over their apartment becomes a barometer for collective hope and despair. Told in shifting points of view—Alex’s, Ruth’s, and the little dog’s—Heroic Measures is a moving, deft novel about urban anxiety and the love that deepens over years. 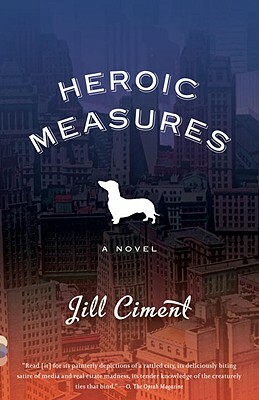 Jill Ciment was born in Montreal, Canada. She is the author of the novels Act of God, The Tattoo Artist, Teeth of the Dog, and The Law of Falling Bodies; a collection of stories, Small Claims; and a memoir, Half a Life. She has been awarded a National Endowment for the Arts, a NEA Japan Fellowship Prize, two New York State Fellowships for the Arts, the Janet Heidinger Kafka Prize, and a Guggenheim Fellowship. Ciment is a professor at the University of Florida. She lives in Gainesville, Florida.